The handy new iOS 6 reply with a text message feature is for those times when you can’t take a call on your iPhone. If you can’t take a call on your iPhone, you can still be polite or give callers a sense that you do care about them too. 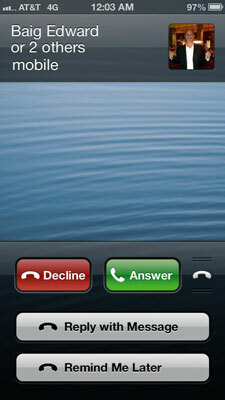 Simply drag up the Phone icon that appears when you see the Slide to Answer option and select Reply with Message. You can select from three canned messages (I’ll Call You Later, I’m on My Way, and What’s Up?) or create a custom reply. When you tap any of these options, the caller will get your outgoing voicemail message and receive whichever of the text options you chose to send. If you tap Remind Me Later instead of Reply with Message, you can arrange to receive a reminder notification in One Hour, When I Leave (the current location), or When I get home. Meanwhile, the caller again hears your voicemail message. Sometimes you’re perfectly willing to take a call but need to silence the ringer, lest the people sitting near you in the movie theater or corporate boardroom cast an evil eye your way. To do so, press the sleep/wake button a single time or press one of the volume buttons. You’ll still have the opportunity to answer. You can use this technique also to turn off vibration mode.